Jain Irrigation System Limited - Manufacturer of biofertilizer, green houses & sprinkler irrigation systems in Mumbai, Maharashtra. The setup is made to treat liquid as well as solid wastes. Rejuvenation of Soil & healthy Plant & soil relationship. Conversion of Bio-waste into organic bio-fertilizers. Unique microbial and vermiculture conversion technology. 7,000 MT of bio-fertilizers to be produced per annum. Pioneering work to develop an unique process. Jain Green Houses are built of a G.I. structure wherein crops are grown under a favorable artificially controlled environment and other conditions viz. temperature, humidity, light intensity, photo period, ventilation, soil media, disease control, irrigation, Fertigation and other agronomical practices throughout the season irrespective of the natural conditions outside. Jain Green Houses are available in different sizes and constructed as per customer requirement. The sizes vary from as small as 100 Sq. M to 10,000 Sq M and more. The degree of sophistication also varies from a simple polyhouse with polythein sheet covering to highly sophisticated, fully automated systems with Poly carbonate sheet roofing (double walled), PAR lightings, boom irrigation, rolling benches and full scale computerized (fully automated) systems. High impact and corrosion resistant engineering plastic construction. Heavy duty SS retraction spring. Anti Drain Valve to avoid puddling. Ratchet mechanism to adjust the spray direction. Separate filter at nozzle inlet. Wiper seal with self flushing mechanism. SS Screw for fine tuning of radius. Operating pressure 2 kg/cm² (28.44 psi). Manufactured from reinforced engineering plastic material. Available in various sizes from ¾” to 2” BSPT & NPT male threaded inlet & outlet and flow rates ranging from 3 to 25 m³/hr (13 to 110 gpm). 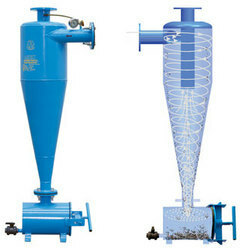 Different filtration element options offers flexibility in selection of filters. - Unique ‘Smart-Clean’ element, assures high performance and effective filtration. - Turbo-Clean element, works on cylindrical vortex flow to offer efficient filtration and online flushing. 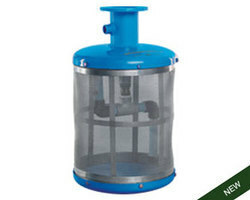 - Plastic element with stainless steel mesh, to give maximum filtration area (for 3 & 7 m³/hr filters). 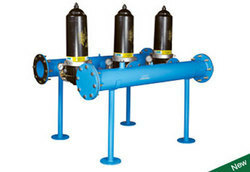 Specially designed manifolds suitable for installation of multiple units of Jain Super Flow Plus filter. Coated Inlet/outlet manifold with more than 70 micron deep blue coloured epoxy powder from both inside and outside surface for protection against corrosion and weather effects. Can also be supplied with light weight, durable HDPE manifold or chemical resistant stainless steel manifold. Please specify while placing the order. 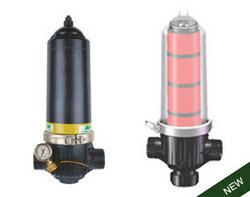 Equipped with high performance, durable valves which can provide consistent performance over the years. Standard end connections are BSP flanged. Please specify for other end connections. On demand, semi-automatic and fully automatic options are available. 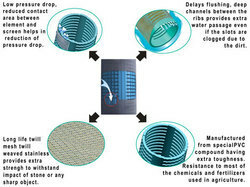 Unique design of ribbed element to provide extra water passage to reduce pressure loss across the element which gives high filtration efficiency. High strength stainless steel ‘Twill’ mesh reduces possibility of tearing due to continuous abrasion. Suitable for screen filters having flow direction from outside of the element towards inside (Out to In). Available in standard screen size of 100 micron size. 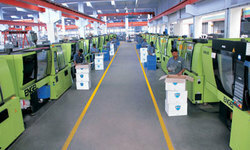 (other sizes such as 50, 74, 150, 200 microns are available On demand). Equipped with Smart-Clean, Unique filtering element, to assure high performance and effective filtration. Drain valve position on upper & lower sides of the body provides installation flexibility. Easy to open and clean. ‘L’ shaped body allows installation in angular fashion. Tangential inlet protects the screen from direct impact of sharp / angular particles. Equipped with Smart-Clean™, unique filtering element, to assure high performance and effective filtration. Available in standard mesh of 100 micron size. (other mesh sizes available on request). Slant drain valve position at the bottom facilitates effective flushing. Three way valve assembly for easy monitoring of inlet & outlet pressure. Standard end connections are BSP male thread. Please specify for other end connections. (NPT male thread or Easy-Fix™). 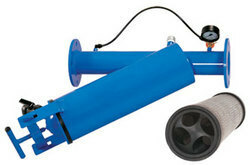 On demand, Super Clean filter can also be supplied with automatic flushing option. Super Clean filter can also be supplied in stainless steel body. 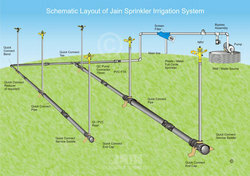 Micro & Sprinkler irrigation systems. Strong and smooth opening, drip-tight SS clamp closure. Disclean® element with strong, precision engineered and radially grooved disc to provide fine three dimensional filtration. (Flow direction Out to In). Available in standard filtration 130 micron. (Other mesh sizes are available On demand). CPSSPC15 1.5" 1.911" 6.30" 0.722"
CPSSPC20 2" 2.374" 6.30" 0.755"
CPSSPC30 3" 3.500" 8.07" 1.200"
CPSSPC40 4" 4.500" 9.06" 1.300"
CPSSPC50 5" 5.562" 10.43" 1.405"
CPSSPC60 6" 6.624" 10.43" 1.511"
CPSSPC80 8" 8.624" 11.22" 1.711"
Disc element construction allows easy cleaning under flowing water. Flow direction from outside of the filtering element to inside. (Out to In). Standard end connections are BSP flanged for ‘Y’ type and BSP & NPT male threaded for ‘L’ type model. Please specify for other end connections. On demand, Disclean - ML can also be supplied with automatic flushing option. Disclean - ML filter can also be supplied with stainless steel body. Turbo-Clean® mechanism creates continuous vortex inside the element, preventing contaminants from settling on the filtration surface. ‘Y’ shaped body keeps inlet & outlet in one line. Flow direction from inside of the element to outside (In to Out). Specially designed, collapse resistant stainless steel element. Hydraulically powered spray rotor continuously displaces trash/debris away from the screen. Flushing of screen using filtered water. Special provision of ¾” screen filter to avoid plugging of nozzles (optional). Constructed from mild steel body and stainless steel screen. Stainless steel body can be supplied on demand. Coated with more than 70 micron thick deep blue coloured epoxy powder from both inside and outside surface for protection against corrosion. Low frictional loss across the filter. Strong metal ribbed supported screen to avoid collapse due to suction pressure. Available in standard screen size of 400 micron. Other screen size can be supplied on demand. The unique design of manifold for single tank unit facilitates flushing with filtered water. Available in manual, semi automatic or fully automatic backwash options. Filtration media is crushed silica sand/quartz gravel of particle size 1 mm to 2 mm (0.039 to 0.078 inch). Effective filtration of 75 micron (200 mesh). Manufactured from high quality steel as per international fabrication standards. 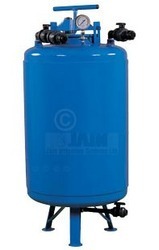 Standard unit consists Filtro-Master tank without manifold and accessories. Specially designed manifold suitable for different models can be supplied as a special order. Fabricated with galvanised / Coated pipe in various combination to assemble single or multiple unit of Clean-Master®, Filtro-Master™ and header assemblies. Light weight and cost effective plastic manifold and chemical resistant Stainless Steel manifold are available on demand. For manifold used in Clean-Master®- Single Unit with special provision of screen filter ensures backwash through clean water. Available in Manual, Semi Automatic and Fully Automatic option. 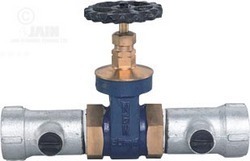 Equipped with high performance, durable valves, which can provide consistent performance over the years. Standard range of manifolds includes sizes compatible with Clean-Master® & Filtro-Master™ (single and multiple units). Other sizes can be supplied on demand. 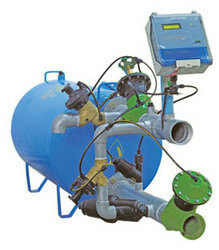 Manufactured as per ANSI/AWWA C-606 standard. Can easily absorb expansion / contraction / deflection effects. Available in 2", 2½" and 3" sizes. Other sizes can be supplied on demand. Uniformly graded, angular sand particles for high filtration efficiency. Particle size range 1 mm to 2 mm (0.039 to 0.078 inch), passes through 10 mesh and retained on 18 mesh. 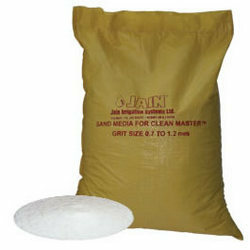 Used as media in various media filters for water filtration. Assembled in high quality thermoplastics box with IP55 protection and transparent lid. 16 char x 2 line user friendly and self-explanatory LCD screen. One touch key pad for easy programming. Bicolour LED, turns red while flushing cycle is on and can be easily seen through transparent lid. Flush time can be set from 0 to 59 minutes in one minute increments. Wait interval can be set from 1 minute to 23 hrs & 59 minutes. Count down timer shows status of backflush. Pause option, can be paused during operation. Useful to pause backwash during fertigation. Charge controller and battery comes in weather proof cabinet. Solar module capacity : 10 Watt. Battery : 12V / 7.5 AH. LED Indications offer user friendliness. Protections: Battery low / Battery high open circuit / short circuit / reverse polarity / Reverse flow of current from battery to SPV module. System operating voltage : 12V DC. 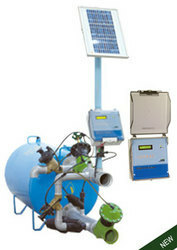 Fertigation System & Chemigation equipment is a need for today's irrigation system. Optimum and efficient use of fertilizers is one of the major advantages of drip irrigation systems. 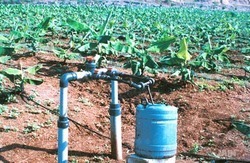 We are well aware that success of micro irrigation system lies in precise application of fertilizers. Jain Fertigation system & Chemigation equipments are highly durable and composed of material inert to chemical and fertilizer reactions. Jain presents most reliable, accurate, automatic, energy efficient and suitable Fertigation Equipments to meet the exact fertilizer need of your crop. Made of strong plastic material with high chemical resistance. Accurate and proportional injection rate. Non electric, operates on hydraulic pressure. Dosing rate can be set externally to desired percentage. - Adjustable from 0.3% to 2%. - Adjustable from 0.4% to 4%. - With Air Release Valve. Available in ¾”, 1", 1½" and 2" BSP inlet/outlet connection. Any other size can be supplied on demand. 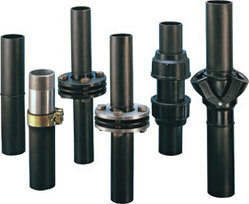 Available in 1½”, 2”, 2½” and 3” BSP Female threaded inlet connections. Any other inlet / outlet connection can be supplied on demand. 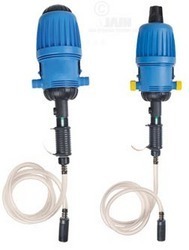 Available in inlet/outlet sizes of ¾”, 1” 1¼”, 1½” and 2” suitable for required fertigation equipment. Any other size or end connection available. Manufactured from high quality PVC compound. Available as per IS-4985, DIN-8062 and ISO-4422-2. Also manufactured to BS-3505/3506, ASTM D1785-84 and ASTM D 2241 on demand. Available as per IS-4985, ISO-4422-2 and DIN-8062. Manufactured from special PVC compound having extra toughness. Anti corrosive. 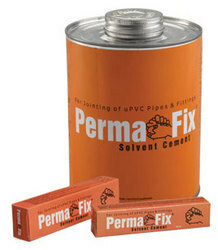 PVC being an inert material most of the chemicals found in soil and water do not affect the casing and screen. Continuous ribs increase permeability by keeping gravel pack away from slot opening. Chemical rehabilitation possible when chocking occurs due to encrustation. Horizontal slots enable laminar flow into the well reducing well entrance losses. Higher permeability reduces draw down and results in saving in pumping energy. Slot width right from 0.2mm to 3.00mm can be provided. The socket and spigot with suitable thread make them easy to install and requires no welding equipments and generator. Manufactured conforming to IS:12818, DIN 4925 (part I to III) and ASTM F 480. Casing and screen available from 1.25” dia to 20” dia. Also available HDPE screen and casing for leachate Gas Extraction. Manufactured from high quality PVC, safe for potable water. An innovative locking arrangement hold the joint intact against tensile load coming on the joints and the external ribs take care of torsion forces (i.e. the torque developed at the start and stop of pump). Fast and easy to assemble and disassemble. Fast lowering and pulling of pumps, no wait for any joint setting time. No effect on installation or disassembly due to extreme weather conditions. Manufactured from virgin high quality HDPE raw material. Conforming to IS-14151, IS-4984, ASTM D3035 and ISO 4427. Specially designed quick connect® coupler ensures speedy joint and easy detachment. All weather installation or disassembly suitable for extreme site conditions. Nitrile seal gives pressure tight, leak proof joints. Long System Life - resistance to impact, chemicals & salt in water. Available in standard length of 6 m. Other pipe length can be supplied on demand. Smooth inside and outside walls for quick laying and easy drawing of cables. Non-corrosive and resistant to many chemicals and chemically active soils. High tensile strength and modulus of elasticity to absorb Thermal and Mechanical shocks. Complete range of accessories to suit different standards. Quality accepted and approved by reputed all organizations like BSNL, MTNL, TCIL, HCL Lucent, Reliance, etc. Conforming to BSNL/DOT specification G/CDS-03/02 Dec’ 94 and having valid Type Approval. Jain Micro Ducts are specifically made for installation in the existing (new or old, empty or preoccupied) HDPE / PVC ducts by blowing, jetting or pulling technique. The ducts can be bunched & blown in various combinations & colors thus allowing extra channels for future cabling needs & increased pathway. Its low sliding friction aids in easier blowing & jetting of micro ducts & allows longer pulling distance thus increasing duct integrity resulting in quality installation at lower cost. Jain Micro Ducts are available in 7mm, 10mm & 14 mm OD with different wall-thicknesses. B-SURE™ SWR System has immunity to corrosion and resistance to all types of chemicals used in detergents and disinfectants. B-SURE™ SWR System is a result of 30 years experience in Polymer processing at JAINS. B-SURE™ SWR System is ably supported by our well spread out dealer network. 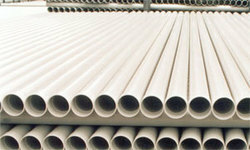 Jain Polyethylene Gas Pipe are suitable for Gas distribution network both for domestic & industrial consumption. PE-100 SDR 7 & 9 are suitable for use in cross country gas conveyance pipeline systems. The propagation of a plant by using a plant part or single cell or group cell in a test tube under very controlled and hygienic conditions is called "Tissue Culture". 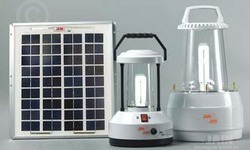 Jain Jyot Solar Lantern is a portable, stand alone lighting unit consisting of SPV panel, Compact Fluorescent Lamp (CFL), sealed maintenance free battery, high effciency electronic circuitry and charging cable. It is available in different modules. Drip irrigation is today's need because Water - nature's gift to mankind is not unlimited and free forever. World water resources are fast diminishing. The one and only answer to this problem is Jain Drip Irrigation Systems. 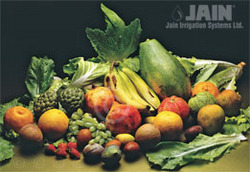 “Jain Drip” the name which you can trust, the only manufacturer of all drip irrigation components. After detailed study of inter-relationship among soil, water, crop, land terrain and related agro climatic conditions, Jains design a suitable and economically viable system to deliver a measured quantity of water at the root zone of each plant at regular intervals. This is to ensure that the plants do not suffer from stress or strain of less and over watering. The system installed at the farmer’s field is commissioned and training imparted to the farmer, followed by regular after sales services. The result – A totally customized, efficient and long-life system which ensures saving in water, early maturity and a bountiful harvest, season after season, year after year. Apart from all this, savings in labour and fertilizer costs. We at Jains, Jalgaon manufacture Dehydrated Onion and vegetable products and Aseptic fruit purees, concentrates, clarified juices, IQF, and Frozen products of finest quality. We market these under our brand name FarmFresh. For centuries, India has been the premier supplier of spices & tea to the world. It is also the second largest producer of fruits and vegetables in the world. Fertile soils, a dry climate, clean water and abundant sunlight help the hard working farmers to produce a bountiful harvest. Though vast, these resources have so far remained mostly untapped. Jains have the most controlled modern, world class fruit processing facility setup at Jalgaon. Selected varieties of Banana, Guava, Mango, Pomegranate, Aonlas, Papaya and Tomato puree are grown in the farms and processed in the plant. EX-CEL® Plastic Sheets, a registered brand in the world market since 1990 is manufactured by Jain Irrigation Systems Limited in their state of the art facility equipped with "Cincinnati Milacron" and "Omipa" machinery & equipment at Jalgaon, India. Jains are today, the only manufacturer of PVC & Polycarbonate Sheets under one roof in South East Asia. We are one of the Largest Plastic processors in India, processing over 100,000 MT of different polymers per annum. The manufacturing facility is ISO 9001:2000 & ISO 14001 - 2004 certified by TUV Germany. Our products are specially formulated at our well equipped in-house R&D facility. This R&D facility is also used for perfecting new product development and new applications coming up from interaction with our customers and end users. Superior quality with prompt customer service, has assured JAINS a committed customer support in the globle markets since the last 26 years . A packaged home lighting system which can supply required power for 9 W / 11 W Compact Fluorescent Lamp (CFL) & 20 W Fan / TV (B&W)/ The unit consists of Lead Acid Tubular Battery, Charge Controller with electronic circuitry, charging cable and SPV Panel . Systems for more lighting hours and/or more lamps and fans / TV (B&W) are available on request. We help farmers develop High Tech Agriculture Farms by imparting, training, providing technical services and at the same time assuring buy-back of specific crops at agreed prices. To demonstrate modern Irri-tech and hi-tech agriculture, a model farm has been developed, where Planting of horticultural crops, mainly Mango, Guava and Custard Apple, has been undertaken on a large scale. Over 100,000 trees have been planted under different soil conditions. Vegetables, including Onion and Capsicum are also cultivated as intercrops between these horticultural plants. A scientific nursery for grafting horticultural plants has been established. Agro forestry species, such as Amla, Teak & Bamboo have also been planted. All these crops are being grown using hi-tech agricultural inputs including Drip, Fertigation, Tissue Culture, Green Houses etc. 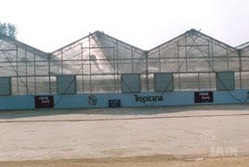 The company has pioneered tissue culture of ‘Grand Nain’ variety of banana since 1994-95. The Jain Tissue Culture laboratory has successfully micro-propagated and sold over 2 million ‘Grand Nain’ banana plants with outstanding success. It is the largest Banana Tissue Culture laboratory in the country. The farmers have increased their productivity from an average of 12 kg to over 26 kg per bunch per year and have taken consecutively crops with two ratoons in about 30 months. Strong and smooth opening, drip-tight, stainless steel clamp closure. Unique ‘Smart-Clean’ element, assures high performance and effective filtration. (Flow direction Out to In). Optional two outlet positions facilitates installation in angular or straight fashion.